Route 189 was formed in 1997. The aim was to convert route 139 to one person operation – previously the 139 had been Routemaster operated. 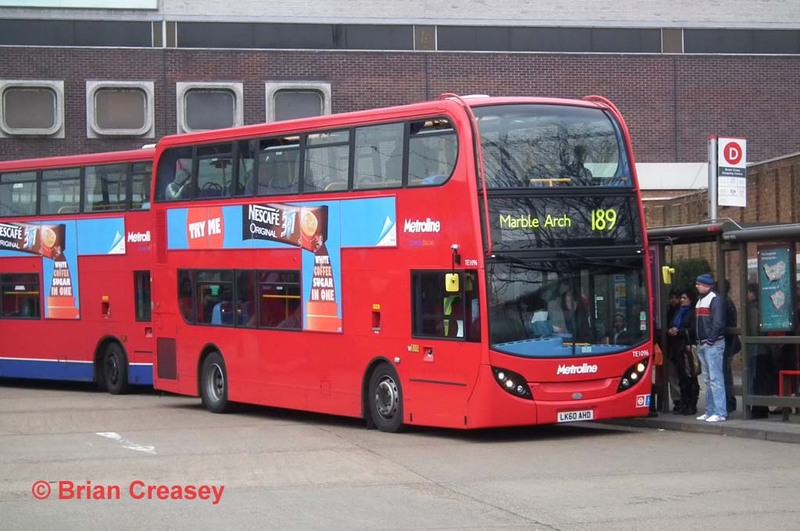 Instead of simply buying new double deckers to replace them, it was decided to convert the 139 to Dennis Darts, and supplement the service by introducing the 189. Why is a mystery – the 139 was already quite frequent at every 8 minutes, so the combined service on the common section is now every 4 minutes! Although the 139 ran from West Hampstead to Trafalgar Square, the 189 stops short at Oxford Circus. This is most unfortunate as it takes up precious stand space there – finding enough space to allow buses enough stand time to provide a robust schedule is very difficult in central London, as nearly all termini are on-street stands. Therefore the last thing that was needed was the introduction of a completely new and unnecessary route! Furthermore the increase in buses along Oxford Street just added to chronic congestion. The 189 also served a dual function to assist replacing route 16A. This had run from Brent Cross, straight down Edgware Road to Marble Arch, and then on to Oxford Circus, but at a much lower frequency than the 189. 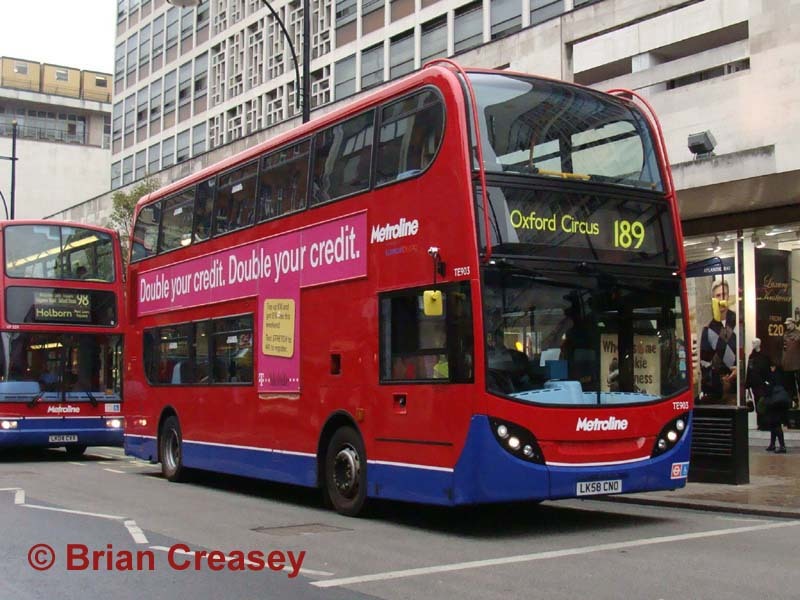 The 189 started from Brent Cross, running via Claremont Road, Cricklewood Broadway, and Kilburn before using Quex Road to join the 139 route to central London. This thus maintained the link between Brent Cross and Cricklewood/Kilburn (albeit via a different intermediate route), and also between Cricklewood and Oxford Circus – the 98 already linked Kilburn and Maida Vale to Oxford Street. This arrangement also provided a useful new link from Abbey Road to Kilburn, Cricklewood and Brent Cross. High frequency single deck operations have never worked as intended, and, with a combined headway of 4 minutes, bunching on the 139/189 was inevitable. To address overcrowding and provide extra capacity, the routes were converted to double deck, but maintaining the increased frequency. The route has seen a variety of types over the years, but the latest development has seen the route converted to hybrid operation using E40H hybrids. 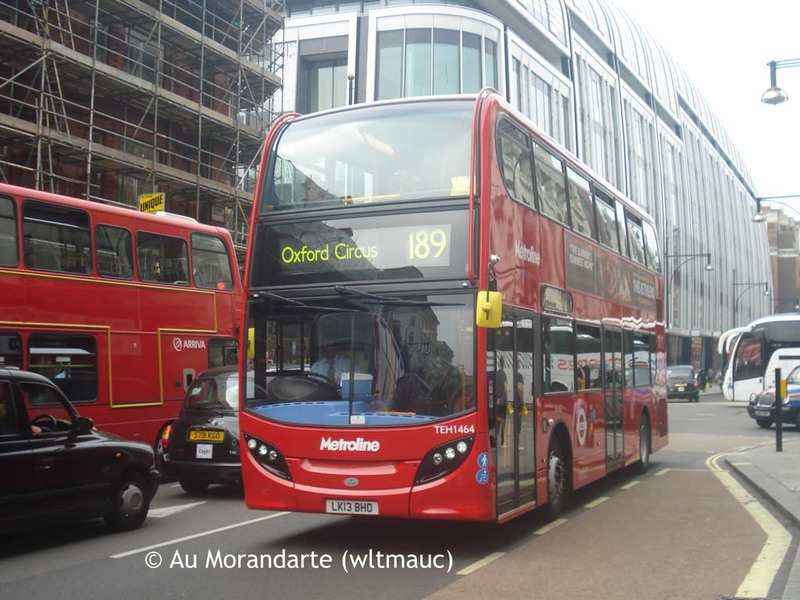 One of those is TEH1464 (LK13 BHO), seen in Oxford Street on 20 June 2013. I have retained a picture of one of the earlier Trident/Enviro400s, with the older blue skirt livery, TE903 (LX58 CNO) was seen in Oxford Street on 5 November 2008 – demonstrating the over-bussing of routes in this street, as it is practically devoid of passengers! New London mayor Boris Johnson has promised to tackle the "wall of red buses," although whether cuts will be targeted where they can be sustained remains to be seen.